One of the most exciting young stallions to enter the Summerhill armoury has just arrived. Timeform’s Champion Handicapper of 2006, STRONGHOLD, one of the last remaining Group-winning sons of the great Danehill, has entered quarantine in Cape Town as well. But that’s not the end of STRONGHOLD. He’s not only a son of one of the most formidable stallions of the modern era; he’s out of a Group-winning daughter of Mr. Prospector, and she in turn is a daughter of a Group One-winning mare by the splendid Riverman. And he’s as good looking a son of Danehill as you could wish for. A big, burly individual with a “like father-like-son” walk very much in the mould of his famous forebear, STRONGHOLD is the kind of horse that evokes goose bumps. 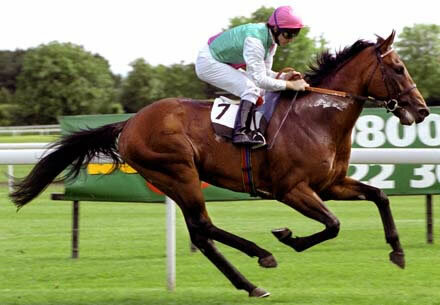 His Champion trainer, John Gosden, insisted on keeping him in training as a four year old, despite the issues that had plagued him since he was a juvenile, in the hope that this was a genuine Group One winner in waiting. While the adage that one man’s misfortune is another man’s gain was never truer than it was in the case of STRONGHOLD, it was a sadness that such a promising career should’ve come to so abrupt an end, as a consequence of post-operative surgery. STRONGHOLD’s gallant solo effort after his “op” when he went down narrowly in the Hungerford Stakes (Gr.2) to the multiple Group One winner Red Evie, very nearly vindicated his trainer’s view, but it also put an end to a career punctuated with “what if’s”. The reality is, he wouldn’t have been at Summerhill had he become a Group One winner. Prince Khalid Abdullah’s famed Juddmonte nursery is already home to another top quality sire son of Danehill in Dansili, and there’s little doubt this fellow would’ve joined the line-up as a Group One winner. From our perspective, we’ve reason to pinch ourselves. His name tells the story.